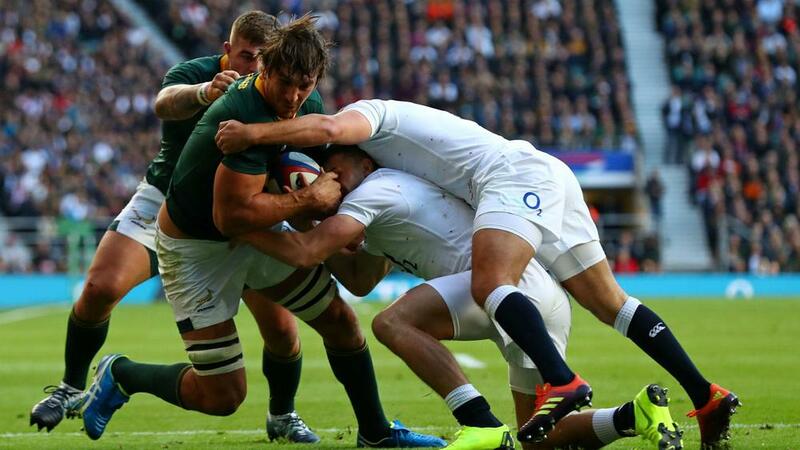 Eben Etzebeth may miss the rest of South Africa's tour of the northern hemisphere after limping out of a 12-11 defeat to England on Saturday. The influential lock hobbled off early in the second half at Twickenham with what appeared to be an ankle injury. Springboks head coach Rassie Erasmus revealed Etzebeth has no chance of facing France in Paris next week and could also miss the Tests against Scotland and Wales. "Eben looks pretty bad," said Erasmus. "He is out definitely for next week and maybe the tour. "The way he is walking doesn't look great, it looks like an ankle and will be a while before he is playing again." South Africa dominated the first half, but a lack of ruthlessness meant they only went in at the break with an 8-6 lead courtesy of S'busiso Nkosi's try and a Handre Pollard penalty. Pollard missed a chance to win it from the tee after a penalty from Owen Farrell, who breathed a sigh of relief right at the end when he was not punished for a tackle on Andre Esterhuizen which may have been deemed to be dangerous. Captain Siya Kolisi says the Springboks only have themselves to blame for falling short. "We made it really tough for ourselves. I think we didn't capitalise on our opportunities when we had them, especially when we got to the 22," he told Sky Sports. "We had so many chances that we could've taken, but England played really well today. The tough thing for us is that we know we were our own worst enemies. "We stuck with the plan, but the problem is that we didn't execute. The plan worked well, but when we got to the place to take the points, we didn't do that – and that’s the tough thing about it."